Database formats include a Database Connection parameter that defines and stores authentication information. For general information about sharing database connections, please see Using Database Connections. Note that Database Connection parameters may differ slightly, depending on context and/or database format. Select an existing connection, or Add Database Connection to define a new connection. The new connection can be made visible only to the current user, or can be shared among multiple users. This specifies the machine running the Amazon Aurora database as either an IP address or host name. The database must have proper permissions and be set up to accept TCP/IP connections if connecting from a remote machine. When connecting remotely, this specifies the TCP/IP port on which to connect to the DBMS service. The default port is 3306. This field is automatically populated with the information specified in the Input Dataset field, which specifies the name of the database. The database must exist in the DBMS. You can view DB clusters and instances in the Amazon RDS console by using the Clusters view, or the AWS command-line interface. Enter the username and password to access the service. Specifies which SQL operations will be performed by default by this writer. This default writer-level value can be overwritten at the feature type or table level. INSERT: Allows for only INSERT operations. UPDATE and DELETE: These writer modes can be overwritten at the feature type level. The number at which the writer will start writing features into the database. The writer skips the number of features in this parameter, and then it begins writing the features that follow. Usually, the value specified is 0 (this is the default) – a non-zero value is usually only specified when a data load operation is being resumed after failing partway through. The number of features that FME places in each transaction before a transaction is committed to the database. This parameter allows for the execution of SQL statements before opening a table for writing. For example, it may be necessary to drop a constraint before attempting to write to it. The statements will be executed only when the first feature arrives at the writer. 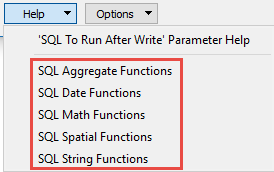 For detailed information about SQL functions, click the corresponding menu item in the SQL to Run editor help . Available menu options depend on the format. Multiple SQL commands can be delimited by a character specified using the FME_SQL_DELIMITER directive, embedded at the beginning of the SQL block. The single character following this directive will be used to split the SQL block into SQL statements, which will then be sent to the database for execution. Note: Include a space before the character. Multiple delimiters are not allowed and the delimiter character will be stripped before being sent to the database. Any errors occurring during the execution of these SQL statements will normally terminate the reader or writer (depending on where the SQL statement is executed) with an error. If the specified statement is preceded by a hyphen (“-”), such errors are ignored. This parameter allows for the execution of SQL statements after a set of tables has been written. For example, it may be necessary to clean up a temporary view after creating it. If Yes, leading and trailing whitespace is stripped from field values.